-Tell me about your journey so far? My journey, well, let me start off with my name; IxChel Tolteca. IxChel means Moon Goddess and Tolteca means artist of life. I kind of embrace both meanings of my name together and I started my journey as an artist. As far as what I do and what I create it’s all divinely interpreted. -What brought you into creating art? Back in 2010 I was hitting a milestone and getting over a transitional period. I had the want and the need to create, so I had already been writing poetry and writing stuff like short stories, but I needed more to give these things some more flavor, so I decided that I wanted to teach myself how to paint. So I did. -Can you tell me how you have evolved both personally and as an artist since first starting? -What is the inspiration for the piece that you’ve made for SOUNDS Academy? My inspiration for the piece is a photo that I have perceived or mirrored of Midori Goto, an American Japanese violinist. She is a child prodigy who started playing violin at 11 years old and has just grown from that. I think her being a woman and I being a woman is inspiring for me. I reflect off of that and for me to emulate her essence makes me feel more empowered. In this painting, I wanted to use this particular piece to inspire other children who are in the Academy to ask questions like, “who is that” and why did you choose her?” When I or someone from SOUNDS Academy tell them that it’s a painting of Midori Goto, they can actually look her up to see her catalog and what she has done in her craft. I like to do that, to pull inspiration from somebody who has made an impact on people throughout their lifetime. -Could you tell me a little bit about your art? So I like to do faces. People often ask me about what I specialize in. I really like to capture a person’s face; I like to look at them intensely so that they feel connected with me or my art. A lot of times you’ll see my paintings having faces with their eyes open. That’s one of my biggest complements “oh the eyes, you really got the eyes”. However, her eyes are closed in this Midoris piece and the reason is because I want people to focus on her being a violinist. I want that to glow from the painting and draw people’s attention, because It’s really not what you see as a musician, it’s what you hear. -What is another piece that you are excited to release? There is another piece I’m working on that I am excited to release called Sade. Sade has split panels. It’s about 6 feet tall and 5 feet wide stretched out and I just think Sade is another part of my inspiration growing up. -Could you talk about a few of your other current projects? The art studio itself, the VXXO Studio is the project. I wanted a gallery and to actually have it falling in my lap as a project, is awesome. I have so many different ideas, so many different things other than art that I want to do in here. I will be making some other pieces to ship over to Ibiza, Spain. I have some good friends who live out there and they want to curate a show for me and a few other artists, so I’m going to ship these pieces overseas. That is going to be a big project to go overseas. 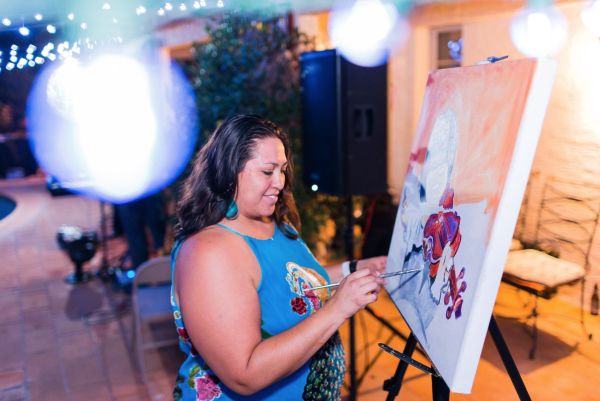 Other than that, little things which is really big here in Phoenix, I still want to incorporate my community in my art by teaching art classes and doing art therapy. There is just an expansive list of other things that I want to do. -Is there a piece that you are particularly proud of? Yeah, one piece in particular that I’m proud of is my Martin Luther King Jr. piece. It was big, it was challenging and I like the way that it is split. Of course, MLK was a dreamer, he was a mover, he was a shaker and to be able to capture all these attributes from that particular picture was amazing. It profoundly spoke to me because Martin Luther King spoke with his hands. Many people see this in videos of his speeches. So I embraced that and captured him speaking from his hands. As an artist I know that hands aren’t the easiest thing to do when painting. So that was a bit challenging because it was on a larger scale, but it just came out beautifully. That’s one of my most inspiring pieces that I have. -What has been, or is currently, a major challenge for you? Life in general is a major challenge. I look at life, I look at art; I look at art, I look at life. I’m a single mother and I have three children that I am raising on my own. My daughter is special needs and is autistic. Getting everybody on schedule during the growth and development is a challenge. However, these challenges don’t stop me from being an artist and from pursuing my dreams, passions and goals. My kids are my inspiration and the reason why I do what I do. So that they can be inspired to do what they want to do on such a greater scale, you own the world type of mentality. -Why do you think music and art education in general is important? So music and art go hand-in-hand because you can be inspired through visualization as well as through sound. Being involved in music and art and understanding the concept of how creativity pulls from that, is so unique. Music education involved with teaching children or even teaching a different range of people how to play music is tapping into the creative side of those individuals. So if you say that “hey we’re little kids and we’re learning how to do art or music” Because that’s really what we grew up with, we learned how to sing and dance. We learned how to paint and color. That was that inner spirit that we had to just go and when I’m around the children and I get to teach them to do the same thing and they get to see me as an adult doing it still, professionally and successfully, I feel like that it inspires them. I think it’s important for other children that feel disadvantage that they can actually pursue themselves and something that they feel passionate about. It’s therapeutic, I could go on. Music is therapeutic, art is therapeutic. It just takes you to a whole other perception. -I heard you recently opened up a studio. How has that affected your business and your art? It’s amazing, I started 8 years ago and here I am today in this art studio that I recently opened up. As soon as we opened this studio up things just started to snowball with people supporting us, encouraging us and being very excited to see the growth. Again, it’s a success story. People are seeing the progression and it’s inspiring them. I’m getting questions like, “how did you do that?”, or “what can I do to be where you are?” Some also say, “I want to start my own business too. I can guide them and redirect them and show them the in-and-outs of some of the things I have had to figure out on my own. -Why are organizations like SOUNDS Academy important? They’re amazing. Art and music education are on the downfall because a lot of schools aren’t recognizing their importance as a sort of teaching mechanism. But we need art and music education. We’ve got a lot of logic out there, but not enough creativity, and technology is just pulling us to that logical side. Art and music education balances out the people on that logical path, Math, Science, English. So I should say that in general, music and other art forms like performing art help people to kind of open up that other channel of their brain, the creative part. It’s very important. In the community, there are some children and families that cannot afford to be in this light of creativity because of finances or they’re stressed out because they might not even be able to eat for the day. A lot of unfortunate families out there can’t even afford to support their child in the arts because they’re living paycheck to paycheck. When you’re stressed out you don’t think about those things. This fun stuff and being in this realm is just obsolete to them. So for children to get that opportunity to disconnect from their reality can have an amazing impact on them. They can be somebody great out of that. -Between the characteristics of creativity, leadership, perseverance, resilience, and teamwork, which speaks the most about your journey so far? Leadership and creativity. Leadership because I had to take a lead in what I do. There are many artists who don’t want to take their art on as a business. They can draw and they can paint and can do this all day, but are they really serious about what it is they want to do? I had to be that leader because I wanted to show that I could be in that lane of progressing and being successful at it. As far as being creative, I get challenged to be creative. Come on, do you wake up every day being super creative? Some people have brain farts or they have writers block so to speak, and you can get that as an artist. However, it calms my mind to pull in something that is really resonating with what I want to paint; that’s where my creativity comes from, to be able to just slow it down, slow down the noise, see, pull it, paint it, inspire it, and redirect it. -Is there anything you would like to say to someone pursuing a similar career as You? Just don’t stop. Keep doing it, you’ve got this. It’s going to be hard, people are going to push you to not do what you want to do because they might not see you being successful in that thing. I really think that we need more people like me to prove that you can have a career in art and music. People still get inspired and still want to feel music; it’s something that people still want to feel connected. We’re all on social media these days and the disconnection is happening through generations and because of that; I think that by having music and continuing to create authentic art is going to bring that connection back together. Families are going to come together in their living room to dance and to sing and to be creative.